Since I don't have that issue (yet!) I made up my own version and I thought I'd share it here, along with the steps for you to make your own if you'd like. Now for a tutorial! I took lots of photos, and I hope you enjoy it! 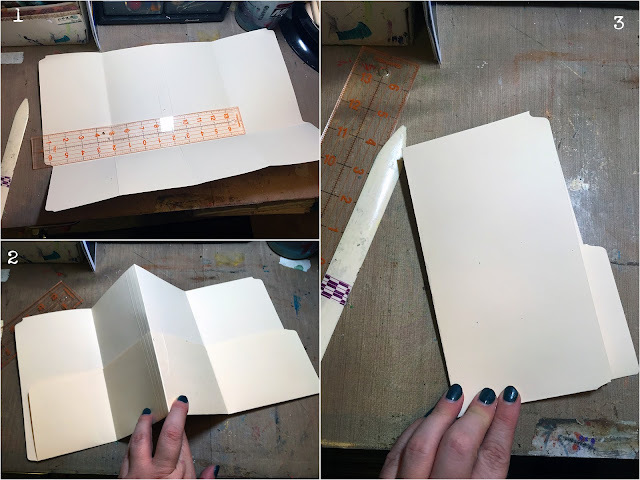 You can make it whatever height you want; I folded up the bottom of mine so that the horizontal fold line would match up with the part of the folder where there was a dip, if that makes sense. 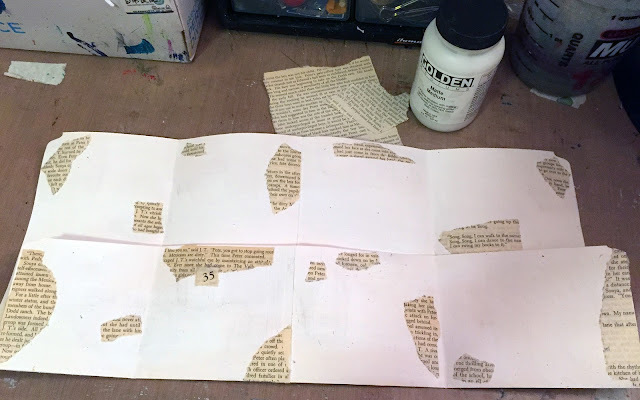 Next, I took a sheet of book paper and tore out pieces and randomly collaged them around the inside of my journal with matte medium. 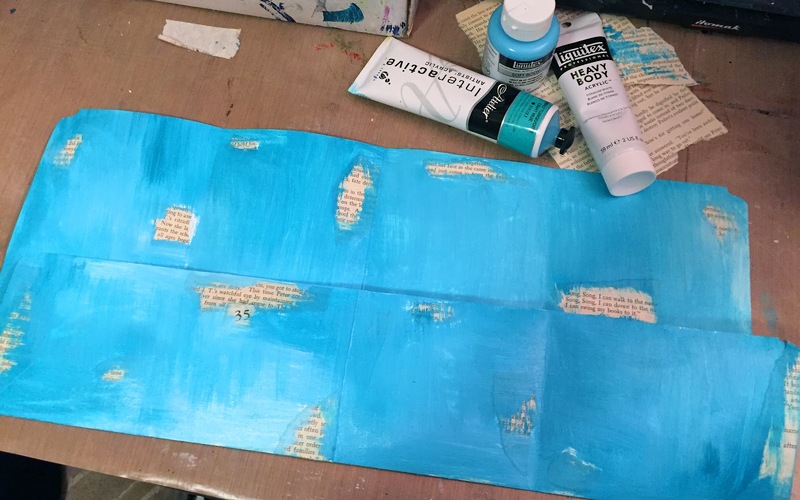 Then I took a few shades of blue paint plus Titanium White and painted it - I did both sides of the folder with these colors. Next it was time to embellish! I was lucky enough to get my hands on a Winter Art Bento Box, so I decided that I wanted to use my little box of tools, paper, and ephemera to do a lot of the embellishing. 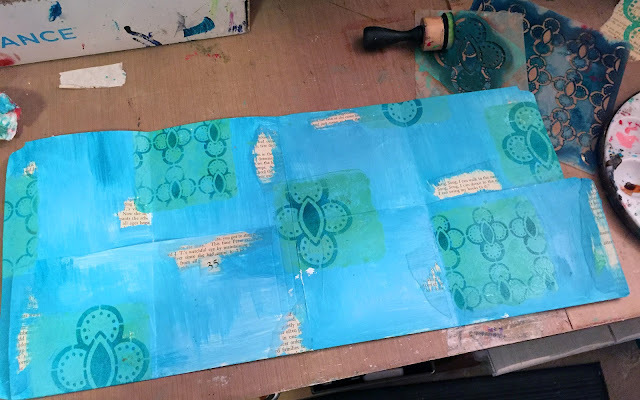 My box came with one of the new mini Gelli plates, and I knew I wanted to use that to create some color fields on my background, so I rolled on some aqua paints and used it like a stamp. Now it's time for stenciling! 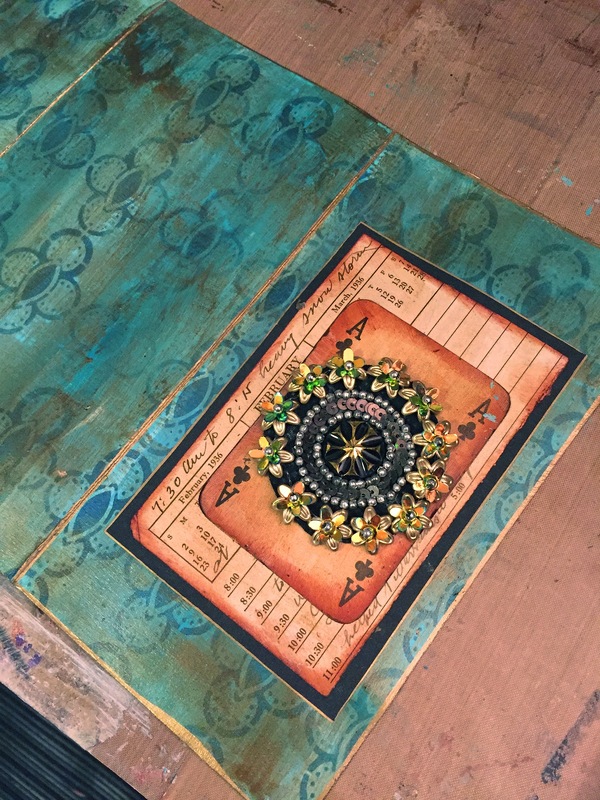 I took out my Ornamental Circle Cluster 4x4 stencil and the Ornamental Circle Cluster Screen along with some Archival Ink and added stenciling just within the Gelli printed squares. I doodled around the edges of the squares a bit and added some paint splatters, but I knew I still needed something to give the whole thing more depth and better unify the elements. I decided to go with a glaze - specifically a "dirty glaze" which I made with Micaceous Iron Oxide and Van Dyke Brown. 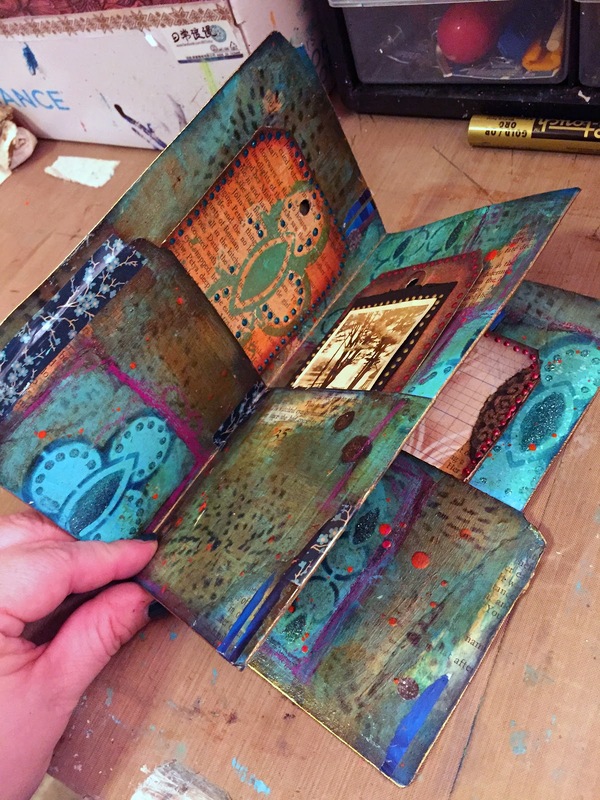 I added some interference gold and used Polymer Medium to make the glaze. 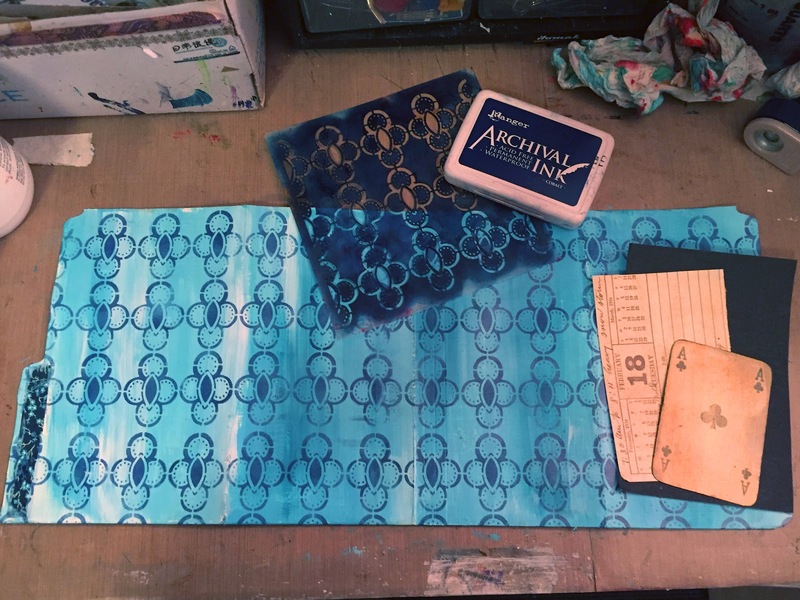 I was thrilled with the results! My Art Bento Box also came with a fun little Stabilo Woody pencil in purple - I used this to go around my printed squares and add some scribbling. 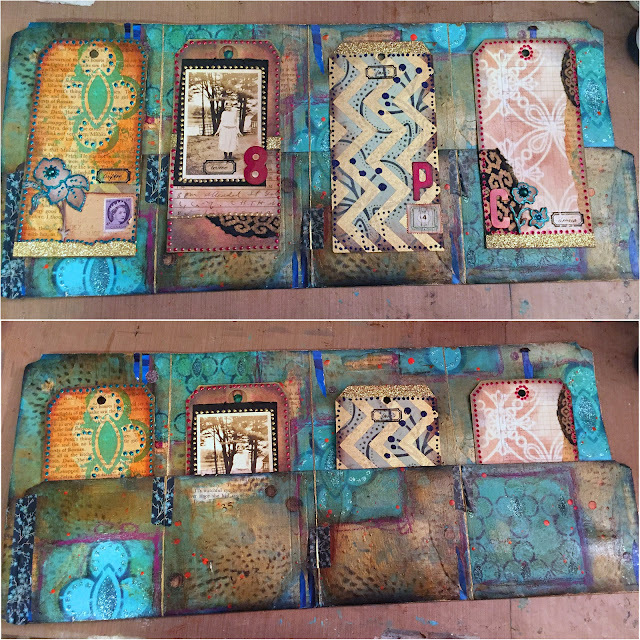 I also went through using the Basket stencil by Daniella Woolf to add texture throughout the background. Next up, the cover! 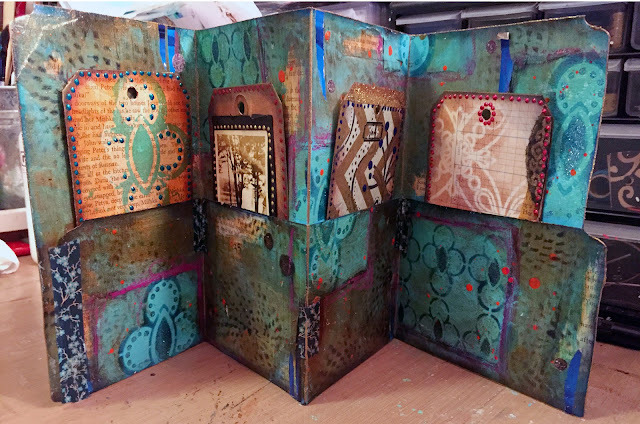 You could decorate each of the sections of the outside as well, but I decided to do a continuous pattern all along that side. 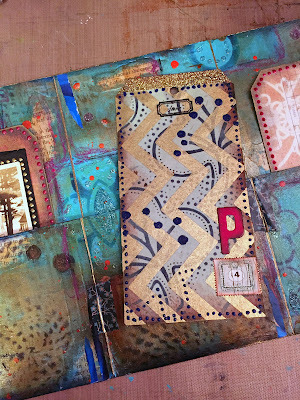 I added my paper and ephemera and adhered it to the cover along with a fabulous sequined sari applique. In between waiting for layers of paint to dry, I worked on the shipping tags that I wanted to put in each of the four pockets. I used papers and ephemera from my Art Bento Box to make the backgrounds and then stenciled and embellished on top. 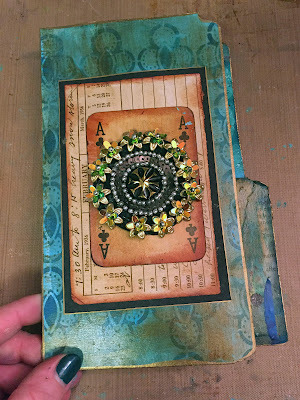 I used the Ornamental Circle Cluster 4x4 stencil again, along with my Ornamental Embroidery Stencil and the Ornamental Petals Screen. Of course being me, there also needed to be some gold glitter tape on each tag. That's it for this month's post... I hope you enjoyed it! 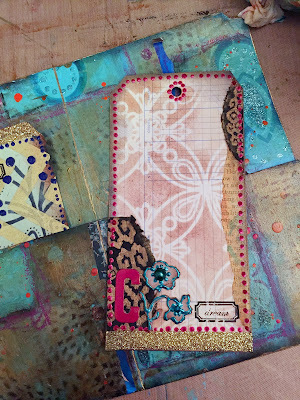 Have you ever made an art journal from a file folder and your StencilGirl stencils? We'd love to see! Thanks Denise! File folders are so fun to play with... can't wait to see what you do! gorgeous! so rich. I love it!! I had saved that email too Gwen, must be the papercrafter in us! :) What you made is GORGEOUS!!!!!!!! haha... right? I still haven't downloaded that issue, but it looks like a good one. And thank you so much! I agree with Maria. 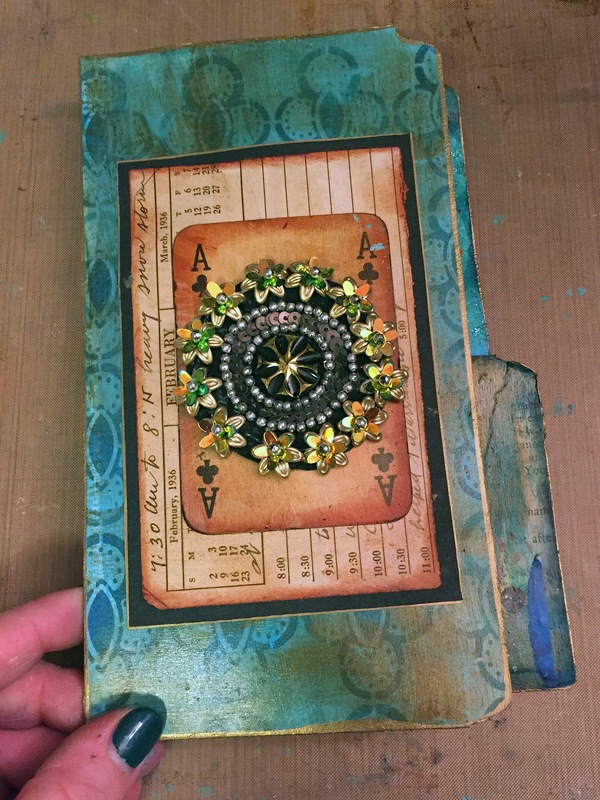 This mini journal is gorgeous. Talk about transforming file folders. Really amazing. I love your style Gwen. Thanks for taking the time to show all the steps. Thanks so much Seth! This one was a lot of fun to make - too fun not to share! This is so attractive and appealing, Gwen! I really love what you have created. 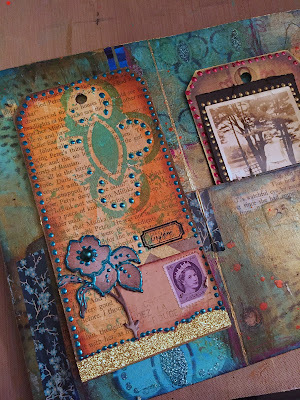 Awesome tutorial and finished folder journal. Thanks Lenna! So glad you liked it! Gwen.. i LOVE this. I have something similar I did a video on, but this is GORGEOUS!!!! Those colors speak to me... or maybe it's just the voices in my head... LOL! Anyway, lots of work that is so appreciated. Thank you Margaret, so glad you liked it! Really Beautiful Gwen, This could make a perfect gift for a special occasion, (wedding, birthday, new baby... )by adding personal items or memories! Thanks for sharing. Love your work. Thanks so much Christine! 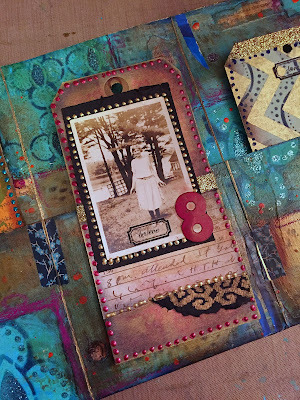 This would definitely be an easy project to personalize - I may have to try this again sometime as a gift... great idea! 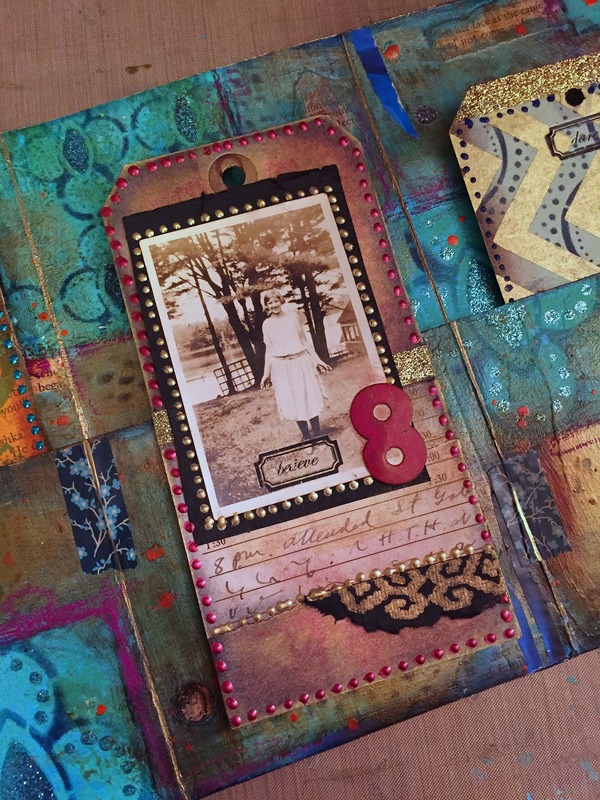 Love this.. Could you go into more detail about the glazing and the glaze products you used.. Thanks.. Thanks! 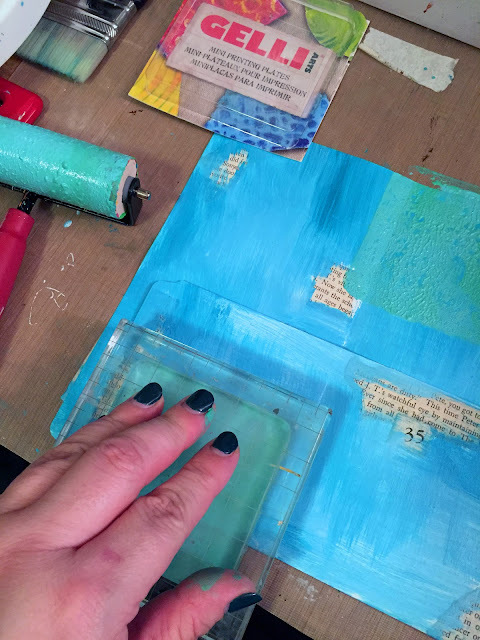 For the glaze, there are lots of different ways you can do it. I used all Golden products for mine, but you could use equivalent colors and products from other brands. 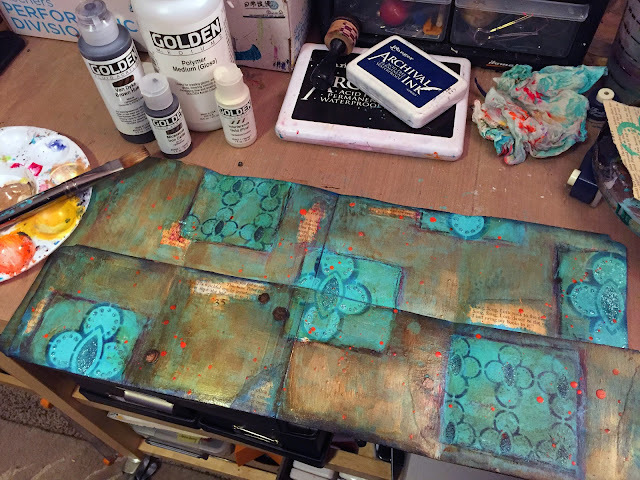 I took Micaceous Iron Oxide and Van Dyke Brown fluid acrylics - about a dime sized puddle of each, and mixed with a good dollop polymer medium (you can use glazing medium or even a soft gel - they just give you a different consistency.) I add a few drops of Interference Gold fluid acrylics a well to make it have that gold shimmer. I just mix it up and brush it on and then let it dry! You can knock it back with a baby wipe in areas if it's too strong and layer it up to make it more opaque. It's not a very exact science, so you can just play with it and find what works. You can try other colors in the glaze, or use a silver or something instead of the Micaceous Iron Oxide (which has a grit to it.) Hope that helps! How brilliant and beautiful is THIS! 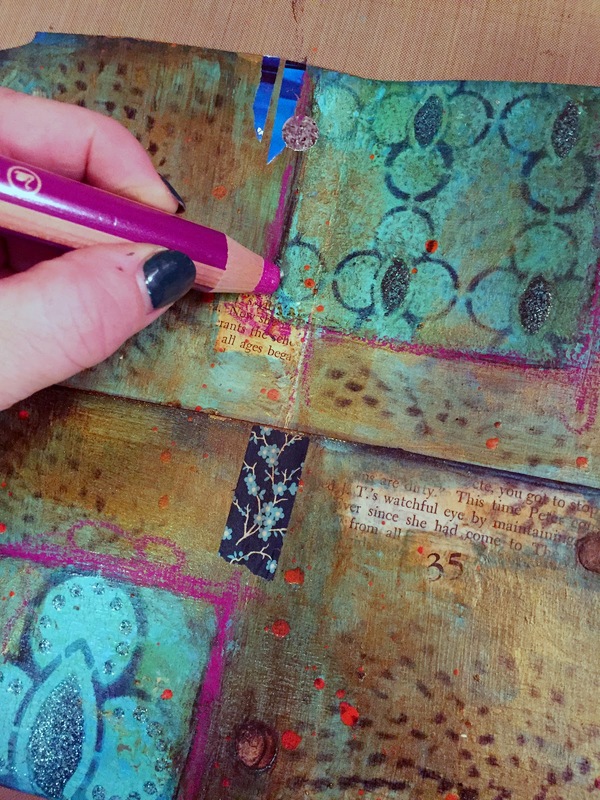 I love this project and it really encourages me to try out using glazes with one of my next projects. The effect is just amazing! Thank you very much for an utterly inspiring project and post! Love this, the colors are awesome! I will definitely be making one (at least) of these. Thank you for the tutorial! Fabulous project. Your color and design sense is always stunning. Great tutorial! What a fabulous mini! Love it! 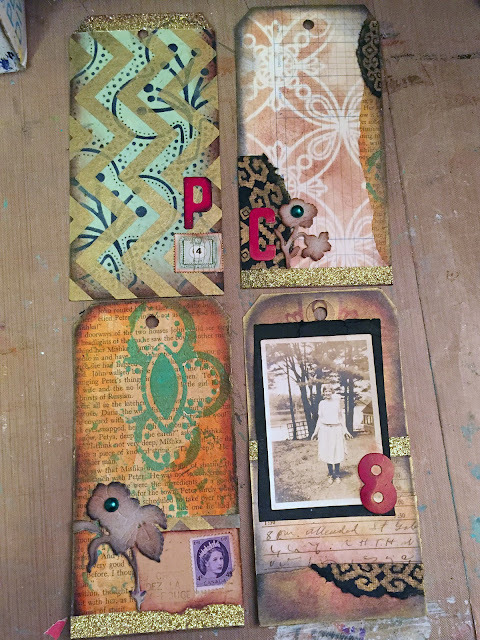 Great use of non- scrapbooking materials with the file folder!